Everyone needs an easy Dairy Free Buttercream Frosting (vegan) for decorating cupcakes, birthdays and special occasion cakes. 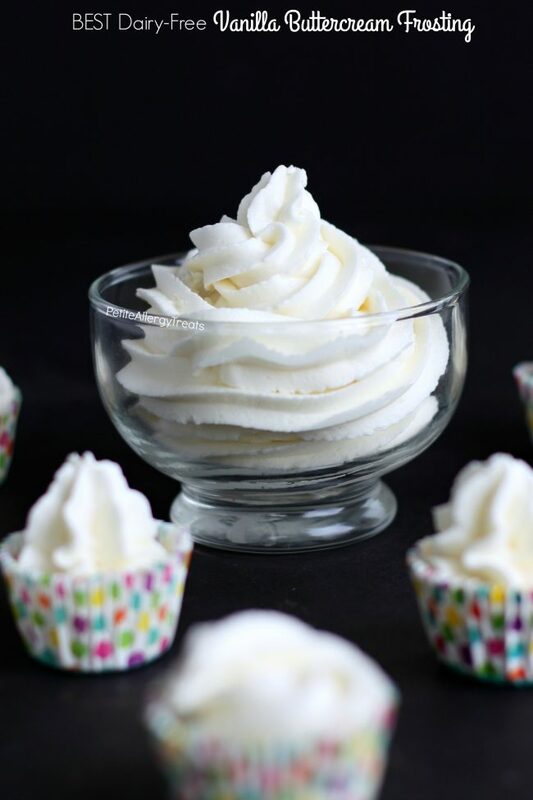 This super easy dairy free vanilla buttercream will easily become your go-to recipe for desserts! This post is so overdue. 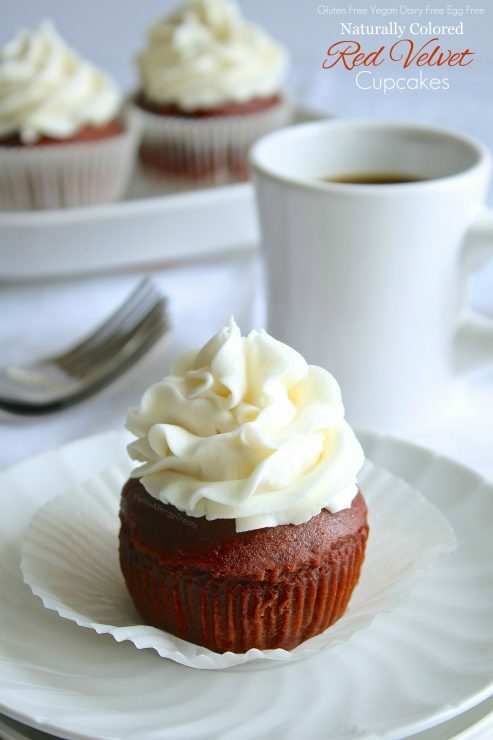 A dairy free buttercream frosting is the backbone for any good cake or cupcake. And I find making tons and freezing helps. Part of the reason this post was delayed was due to near frosting fails. Yes. You can fail at making frosting… but only in the sense that it won’t perform tricks you want it to do. For example, those beautifully decorated cupcakes I’ve seen from The Recipe Rebel and even dairy free butter frosting from The Pretty Bee . I tried many different dairy based buttercreams only to find the frosting was loose and sloppy even though the recipe called for tons of sugar. Even some dairy free recipes were written the same. But from my experience, it would not pipe a lovely design. The problem you can encounter with dairy free icing can be contributed to Emulsion problems. EMULSION- the ability to bind fat molecules with water and other liquids. In other words, oil and water will not separate when mixed. 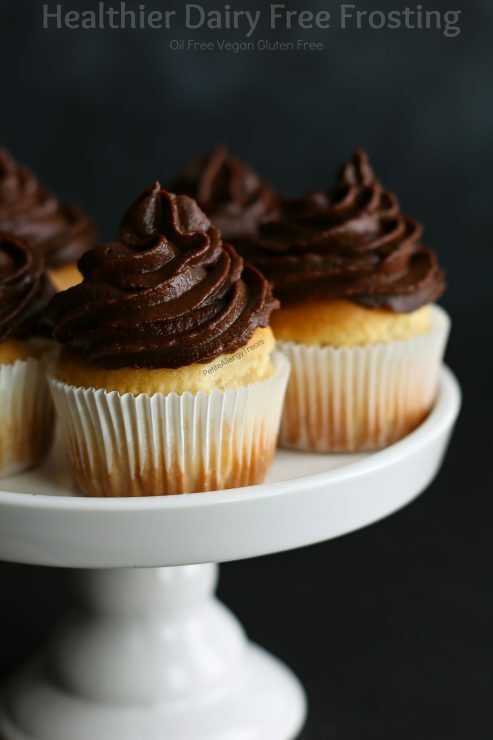 Dairy free frosting problems can* occur since practically every written recipe out there calls for ‘butter’, sugar and milk-or essentially water to smooth things out. Palm shortening is pure fat and contains 0% water, 0% protein. It’s like oil to water. You can mixed it all you want but as soon as you stop, the oil and water will separate again. Other dairy free spreads out there contain Soy oil and Soy Protein. Ever wonder why the protein was there? To mimic dairy butter. I can’t say for sure since I haven’t used it, but I suspect those spreads would make a “better” dairy free buttercream. The reason I say this is with the protein, you’ll have the emulsion problem fixed. You can add tons of sugar for stiffness and then smooth things out with a little dairy free milk or water. The frosting will hold in the liquid where it should be and therefore can be squeezed and shaped for decorating. *Different brands of dairy free vegan spreads have different ingredients and approaches for recreating dairy based butter, which already contains 18% water unlike pure palm shortening which contains 0% water. I have used real butter only once to make frosting and found it to be lovely. Creamy. Pliable. Annd always would pipe well for making things look pretty. So the whole point of this post was to help you realize you’re not crazy when your frosting can’t perform all those twists and turns like regular dairy based frosting. The other major point is now you CAN create a dairy free frosting to pipe beautiful rosettes and designs! My recipe is just that, mine. Looks complete weird with ratios. Not overly sweet either. It has a higher fat to sugar ratio. And the huge difference is there is essentially NO extra liquid added. Add more or less sugar for stiffness. I always suggest doing a test piping of your frosting before you’re done mixing to make sure you have the correct consistency. And you could always add just a little water or milk it you accidentally add too much sugar. But just a little. It would be better to add more shortening than liquid. Remember, add liquid will only cause the frosting to become loose and sloppy for decorating but great for just icing a plain cake. So there you have it. 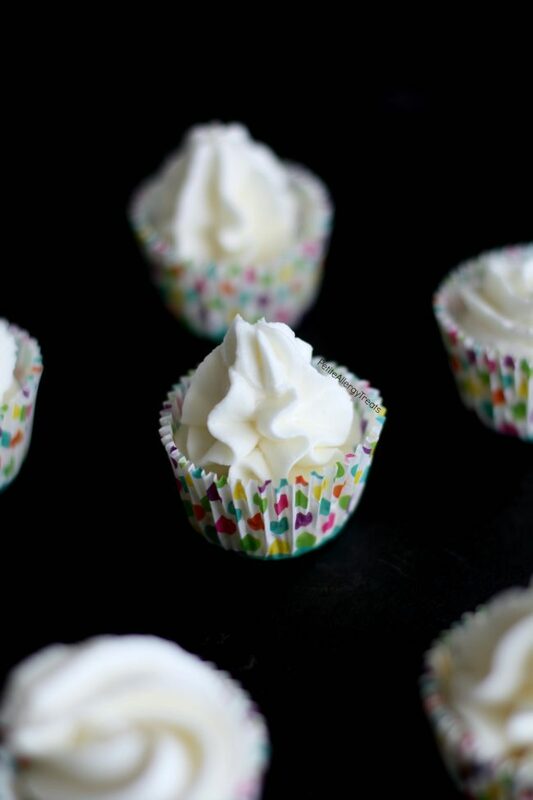 A long winded explanation of why this dairy free buttercream frosting will be the BEST. 😀 And hopefully you can come to rely on for all your allergy friendly decorating needs. Keep in mind this all holds true with palm shortening, again with contains 100% fat, 0% water and 0% protein. Sift powdered sugar to remove any lumps. 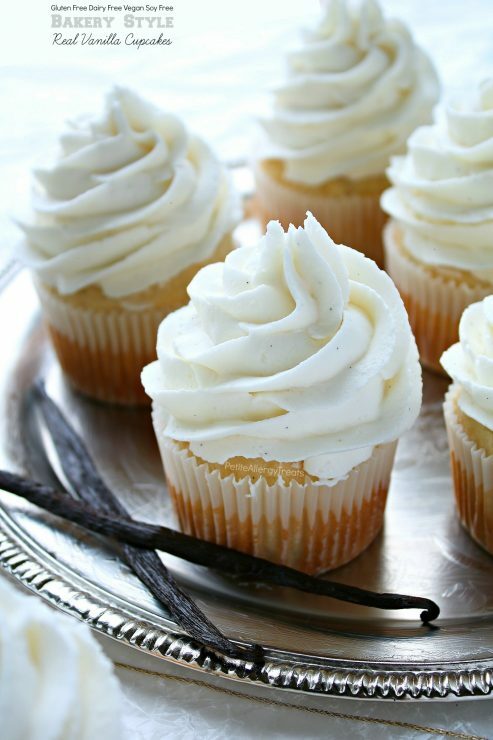 Using palm shortening as mention within the post above can vary in thickness depending up use of the frosting. For decorating designs like rosettes, a stiffer frosting is needed. The sugar content in this frosting is a little lower since you cannot use water or dairy free milks to even things out. See the post above and read about emulsion. So this can be the frosting I use to frost my birthday cake in exactly one month!!! My kiddos would love this spread in their graham crackers! Gorgeous photos too! Shortening is the recommended “fat” when it comes to summer decorated cakes because of the risk of butter melting! 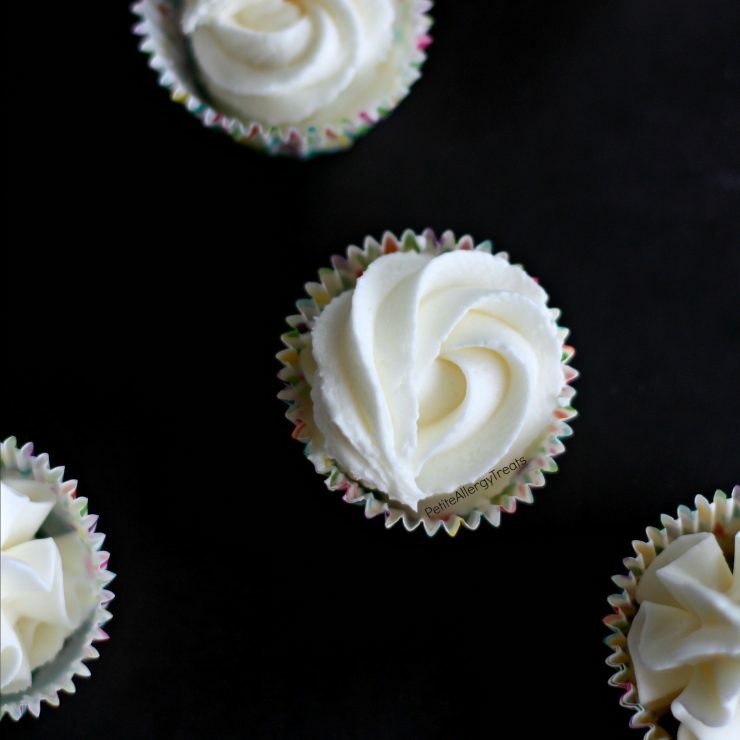 A great dairy-free alternative and it your piping looks beautiful! 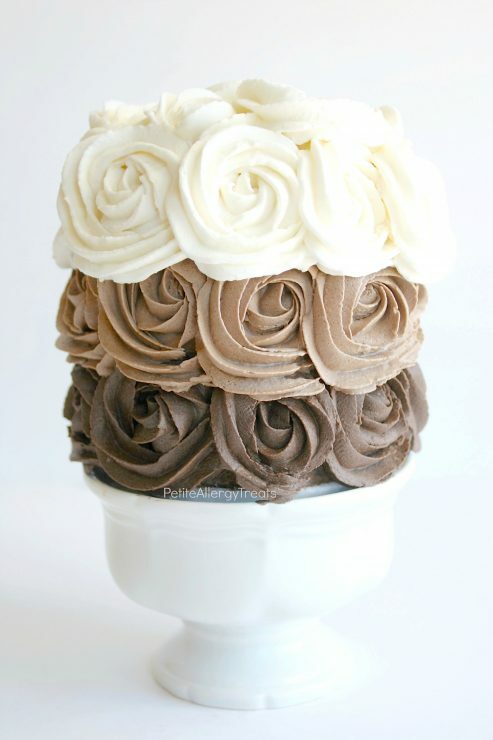 This looks like perfect frosting, what a wonderful alternative! I’ve never made dairy free frosting but yours looks amazing! Now hopefully I won’t have to have any frosting fails! This is amazing! I am trying to eat more dairy-free things and I am so using this recipe the next time I make something that needs frosting. Which brand of Palm shortening do you use? My understanding is that Spectrum is made by Hain Celestial and sadly, they do not have any tree nut free facilities. Thank you in advance. I need a vanilla and chocolate frosting for my daughters birthday, do you think I can add some cocoa powder to this to make it chocolate? Hi Michelle, Yes! You could easily add cocoa powder for a chocolate version. Here’s what I used for my rose cake and for the Harry Potter cake. The difference is in thickness or amount of liquid used (which you need for the cocoa powder). How much liquid you need all depends on the *use* of the frosting; Rose decorations need a stiffer frosting vs just icing for spreading. Good luck! I know this is such a basic question, but what can I substitute for the Palm shortening? Can I use a dairy free butter, or when you say shortening do you mean Crisco? This will be my first icing attempt and I’m really unclear on what to use. Hi Laura, if you do not want to use Palm shortening, either dairy free butter or Crisco shortening (soy based) will work. 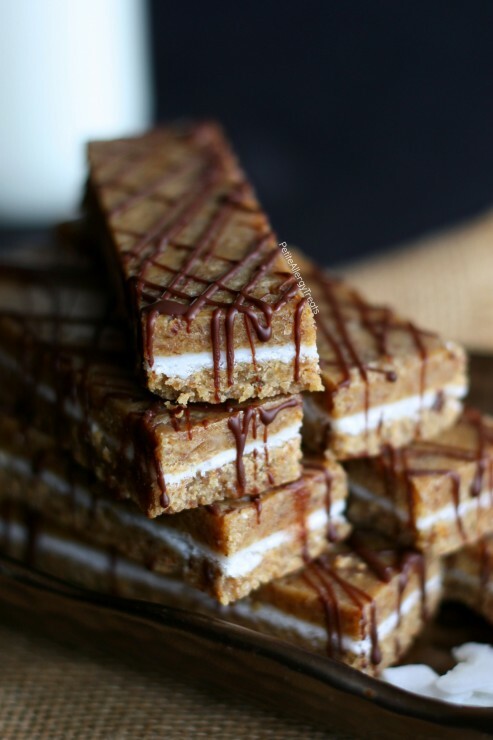 This recipe was specifically created (with less sugar and no liquid) to work with palm shortening since adding liquid causes the icing to become too loose. Icings are all about the feel once mixed, you may need to add a little more or less sugar and non-dairy milk with different dairy-free butters/fats. Hope that helps! I just made this and it was so easy! You said to store it in the fridge- will it be necessary to whip it up before frosting? (In 3 days) Thanks! Hi Marieta, So glad you made the frosting! The whipping might be necessary depending upon the use. 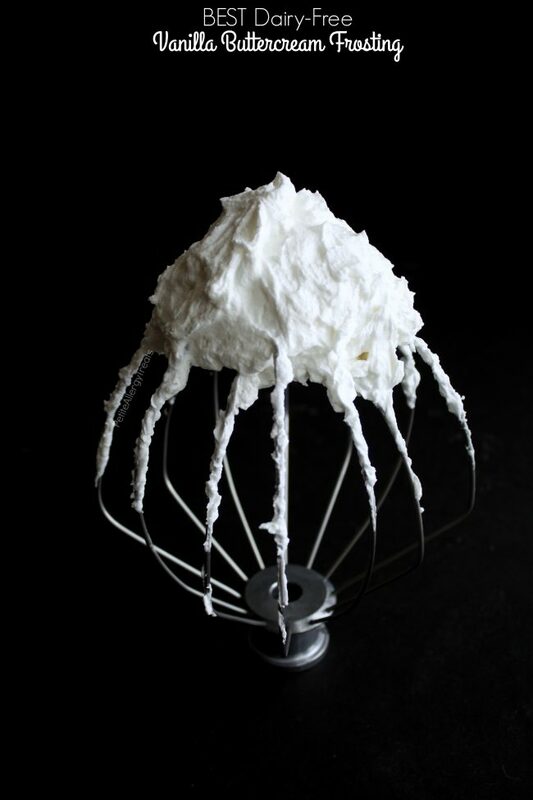 If you’re using it for piping decorations, a quick whip at room temperature would be a good idea but not necessary if just using to frost a layer of cake. I can’t find a store that sells palm shortening would Spectrum Organic Shortening work the same. Just made some frosting with dairy free butter and it was falling off the cake. I’m on a time crunch and don’t have time to order it online. Please help, my son can’t have dairy and trying to make his smash cake. Hi Rachel, Yes-Spectrum Organic shortening would work; it’s the Palm Shortening brand I use. Target used to carry it and I know Whole Foods still does. Good luck!! Can I use Crisco as the shortening , whip it as per the recipe instruction then use it as a layer on top of the cake before I put the fondant on top? My son is very allergic to milk products so I always baje his birthday cakes and cookies and biscuits. next week he wants a cake with fondant Pokémon design. Crisco is soy based but would work great for dairy allergies. Good luck with the decorating and Happy Birthday to your son!! This recipe is delicious! And so simple. Thank you so much! Hi Jessica, Yes you could use any shortening to make it dairy free. The different types will all taste and perform a little different though. Hope that helps! Shortening is a non-dairy solid fat, often made of soy vegetable oils traditionally hydrogenated to make solid (like margarine). There are plenty of non-hydrogenated dairy free shortenings which have been created using liquid nitrogen to freeze/trap air and make the oil ‘solid’. Hope that helps! This frosting is AMAZING! I made it for my daughter’s 5th birthday cake (my 3 year old has an autoimmune disorder and can’t eat wheat, dairy and eggs) and it’s a fantastic consistency with incredible flavour. I used Becel Vegan spread instead of Palm Shortening and didn’t need to add any liquids. My husband wanted to just eat the bowl of frosting! Thank you for this awesome alternative!